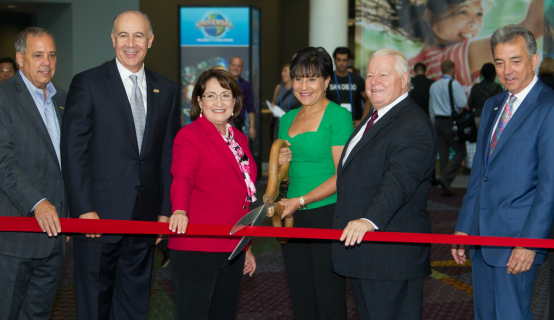 Mayor Teresa Jacobs joined U.S. Department of Commerce Secretary Penny Pritzker and executives from Visit Orlando at the Orange County Convention Center on June 1 to welcome 6,000 domestic and international travel bureaus and exhibitors to the U.S. Travel Association’s 2015 IPW. A three-day industry conference boasting 1,100 exhibitor booths from 74 countries, IPW is reputed as the travel industry’s premier international marketplace and the largest generator of travel to the U.S.
After participating in a ceremonial ribbon cutting with Secretary Pritzker, Mayor Jacobs greeted guests and walked the Convention floor packed with exhibitors of travel products and global destinations ranging from New York City-based Carnegie Hall to Fenway Park tours in Boston. According to the Travel Association’s website, IPW brings travel buyers, suppliers and destinations together to bring international visitors to the United States. The day before the ribbon cutting, Mayor Jacobs joined Visit Orlando and turned the page on a new chapter in the destination’s history by unveiling its first global marketing and sales campaign featuring – “Orlando – the Never Ending Story” – a worldwide consumer campaign in search of the millions of stories visitors have to share about the theme park capital of the world. Coinciding with the start of the campaign’s consumer advertising this year, unforgettable guest experiences will be collected through the website OrlandoStories and visitors are encouraged to use #MyOrlandoStory when sharing posts, photos and videos in social media. The social media campaign has begun, but additional details of the global search for stories will be released this summer. “Visit Orlando is reaching out to the storyteller in all of us to showcase our visitors and the lifetime of memories they made and will make across our destination,” Visit Orlando President and CEO George Aguel said. The campaign will serve as the cornerstone of Visit Orlando’s future global marketing and sales efforts, beginning in August. The first of these will appear in the destination’s No. 1 overseas market, Brazil, as well as Colombia and the U.S., followed by Canada and the United Kingdom. “Orlando is an iconic American destination that truly delivers on the promises that travel offers to us all,” said U.S. Travel Association President and CEO Roger Dow. The announcement was made at the I-Drive 360 complex, home to the Orlando Eye observation wheel; Madame Tussaud’s, an immersive and interactive wax experience; SEA LIFE Orlando Aquarium and a blend of attractions, restaurants, clubs and shops, on world-famous International Drive. The announcement was covered by more than 400 international journalists who were visiting Orange County for the 2015 IPW. This is the seventh time the IPW convention has been held in Orlando. Along with the host region benefitting from the media exposure and a diverse group of international travel buyers, the estimated economic impact attendees spending on hotels, restaurants, entertainment and transportation is $11.8 million. As part of her welcome, Mayor Jacobs issued a proclamation to USTA President and CEO Roger Dow declaring Project: Time Off Week. With Americans utilizing less than 3.5 days of vacation each year for a total of more than 429 million annual vacation days, Mayor Jacobs encouraged residents to enjoy a Central Florida “staycation” to support the travel industry. Immediately following her visit with IPW, Mayor Jacobs toured the annual Premiere Orlando International Beauty event, also held at the Convention Center. Premiere Orlando is the largest professionals-only beauty event in the U.S. After launching at the Convention Center in 1994 with just 1,500 attendees, the event now draws more than 50,000 beauty industry professionals from across the world. A collection of photos from the U.S. Travel Industry Association’s 2015 IPW and Premiere Orlando are available on Flickr for use by the media.